Holes in window or door screens are not only unsightly, but they also invite flying insects into your home. Fortunately, it's a simple fix, whether your screens are metal or fiberglass. Read on to learn how it's done. Ever notice how pesky bugs manage to find their way through even the tiniest holes in your screens? No need to fret. Repairing the little holes is easy, especially if you catch them before they grow into big holes. 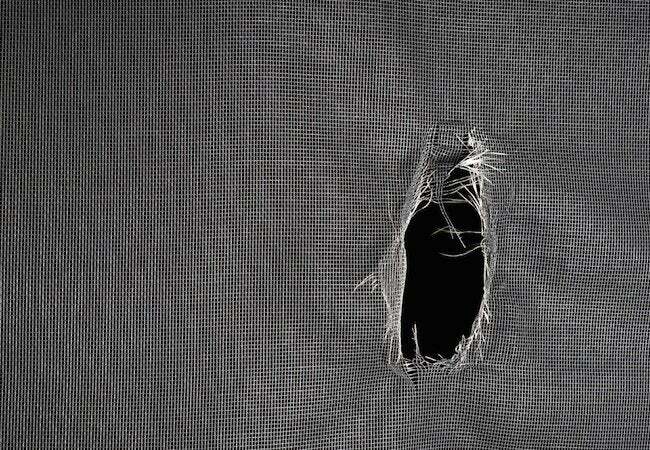 For metal screens, make a patch (using the same screening material) that’s about an inch larger than the hole. Next, unravel about a half inch of fringe around the edge of the patch and bend it at a right angle. Place the patch on the hole, push through the fringe wires, then bend them back to secure the patch. For fiberglass screens, push the fibers of the screen back toward the middle of the hole, then apply a bit of clear nail polish to bond the fibers together. For larger holes, head to the hardware store and pick up a self-adhesive patch that’s a snap to apply.